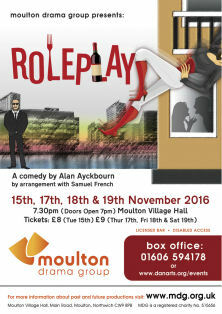 Performances will be held on Wednesday 26 – Saturday 29 April 2017 at Moulton Village Hall. Doors open at 7.00pm and all performances start at 7.30pm. Tickets are on sale soon. 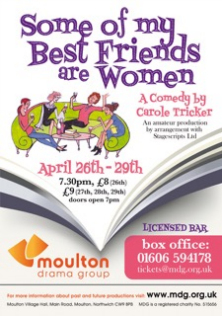 A bright and breezy comedy which takes a humorous look at the women members of a book reading club….a few bottles of wine…..and a couple of men.. 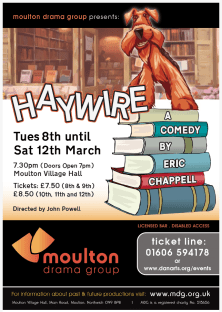 Performances will be held on Tuesday 8 – Saturday 12 March at Moulton Village Hall. 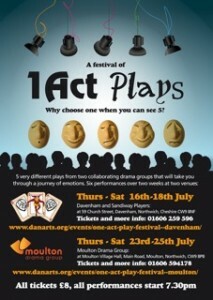 Doors open at 7.00pm and all performances start at 7.30pm. Tickets are on sale soon. Alec Firth is having an affair with his assistant, Liz, and has organized his domestic life so that they can go to Spain on holiday without making Alec’s wife Maggie remotely suspicious. What could possibly go wrong? Plenty. On the doorstep, in dizzyingly rapid succession, are: Phoebe, Alec’s mother, who has discharged herself from her old people’s home; Alec’s son Jamie, with a broken ankle; and his daughter, heavily pregnant and not planning to marry the child’s father .